Power Clan Gathering events kick off this weekend, and we hope that as many local Powers as possible will come out and meet their overseas cousins. We start with a walk through the Anne Valley in Dunhill at 10:30am on Sunday morning, the 28th and we’ll walk together to the ancestral home of the Powers – Dunhill Castle. Our first big night is Sunday the 28th, at 7:30pm in the Tower Hotel where we’ll have an “Irish Night” with great craic, music and dinner – a great chance to informally meet the Powers from around the world. Monday the 29th then is Curraghmore day, where we’ll take a tour of the grounds, the Shell House and the wonderful gardens as well as enjoying a catered picnic lunch. We come back then that evening for a concert in Christchurch starting at 8pm. Our closing event then is the wonderful Sláinte show and dinner in the Undercroft of the Medieval museum. We’d love to see as many local Powers as possible – good memories and fun is guaranteed. Please contact info@powerclangathering.com or call 087-2303546 to reserve a spot – payment can be made at the events but places MUST BE BOOKED for catering purposes. Henry ‘Harry’ Power, born in Waterford in the summer of 1819, was to become one of Australia’s infamous bushrangers – an outlaw who lived in the bush. Convicted as a young man of the theft of a pair of shoes, and a bridle & saddle, Power (under the name Henry Johnston), was convicted and sentenced to 7 years transportation, arriving at the age of 23 in Hobart (Van Diemen’s Land) in 1842, aboard the convict ship Isabella. Having become a free man in 1848, Power now moved to New South Wales and began a career in cattle droving, exploring the mountainous terrain and becoming an expert bushman. He also ran a horse yard out of Geelong. Attracted by the gold discoveries at Geelong and nearby, Power’s life was to be changed by one incident in 1855. Stopped by two policemen while out riding, Power was accused by them of horse stealing, such was the magnificent steed he was riding. Confined to prison, he initially was held on the prison hulk Success. Prison hulks were ships no longer fit for sea, but converted into prisons, harsh and demeaning, even for the time, becoming a notorious way of holding law breakers. Power served some 2 and a half years before being transferred to the prison at Pentridge, from where he escaped in 1862, taking to bush country, falling back on the skills he had learned earlier in life. It was at this time, around the Ovens district of New South Wales, and in Victoria, that he became acquainted with other lawbreaking circles, including the Quinns and most notably, the Kellys. It is said that the notorious Ned Kelly was his ‘apprentice’ for a time and Power was instrumental in guiding him and other would-be bushrangers in survival. Another spell in prison beckoned but Power once again escaped from Pentridge in February 1869, and turned to highway robbery, becoming very successful. He held up mail coaches, committed other robberies and stole horses, having set up permanent camp in the hill country behind the Glenmore Homestead of Kelly family relatives, Jack and Thomas Lloyd. Incidentally, there is now an area close by named Power’s Lookout, named for Harry Power. With a large reward for his capture, he was finally caught, having been betrayed for the reward by the Quinns, in 1870, and was sentenced at the courts of Beechworth to fifteen years hard labour for bushranging, again being held at Pentridge. Released in 1877 on the grounds of ill-health, he returned to the property of one of his female petitioners, a Ms. Clarke, and eventually became a guide on the now museum ship Success, where he had earlier been incarcerated. 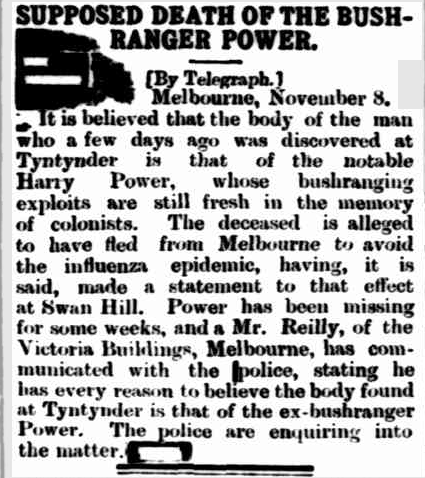 As this article shows, in 1891 Power fell into the water at Swan Hill while fishing and visiting relatives, and was drowned. You can now listen back to our radio interview with Greg Smith from VOCM’s Irish Newfoundland show last weekend. Thanks again Greg. Why not tune in and hear all about our upcoming festival with our friends and fellow Powers from around the world. A phrase heard often in Ireland that “everyone has someone in America!” – meaning that it’s rare the family that doesn’t have connections in the United States, be they first generation or earlier. The phrase is equally accurate for Newfoundland and Canada and in modern times, Australia. Throughout the centuries, Irish people, young and old, have always left this island in their droves and for various reasons – oppression, famine, adventure, war and conflict, opportunity … it is interesting then to see the names of those Powers (and others, of course) that pop up in the pages of newspapers and journals, making their mark in one way or another, before the Internet and instant communication became ubiquitous. There are some great online resources available, allowing us to delve into local (sometimes very local) US history – and when we find a subject – like the recent post on Sheriff John Powers of Nebraska – we take great pleasure in exploring a little bit more about the emigrant in question, trying at least in the broad sense, to add some social context and a sense of place to the individual and those they might have left behind on “the Ould Sod”. An interesting snippet found its way to our keyboard recently, which perusing “The Daily Phoenix” of Columbia, South Carolina, from 1874. The total number of emigrants from Ireland in the first six months of the present year was 45,781, of whom 25,163 were males and 60, 917 were females. As compared with the corresponding period of 1873, there was a decrease of 14,359. Since the 1st of May, 1851, the total emigration from Ireland has been 2,252,745. Despite the inaccuracy in the sum of the first two figures, the last line in that article is simply nothing short of astonishing. Whole cities worth of people were moving lock, stock and barrel from Ireland during this time, and the figures quoted don’t even go back as far as 1847, when the Famine was at it’s height. As a concept, Irish people of today readily acknowledge the Great Famine and all its terrible loss and suffering, but I don’t think we can equate today’s sense of space and freedom with just how many more people were on our island just 150 odd years ago. And to sign off, and as was bound to happen, not all the Powers who made the journey managed to keep their noses out of strife ! PS : That’s a $4000 fine today ! “Honest John” Power (1949-1916) was Sheriff of Douglas County, Nebraska, having emigrated to the New World at the early age of 16. Born in Waterford, Ireland in 1849, in the teeth of the Irish Famine, he arrived as a teenager in the city of Philadelphia he trained as a cooper (barrel maker), before later living in Kansas City, Missouri and eventually settling in Omaha, Nebraska. In 1882, he, like many enterprising Irish emigrants before him, started a business of his own on 4th and Jones Streets, Omaha and soon built up an extensive trade. He is known as “Honest John,” a title which he justly deserves, as all who have come in contact with him, either as a private citizen or a public official, can fully substantiate. He made one of the best sheriffs that Douglas County ever had. In politics Power was a Democrat and was elected to the office of Sheriff of Douglas County in 1899, an office which he held for several years and through several re-elections. Having retired from law enforcement, he once again entered the trading arena, this time in addition to cooperage, he bought and sold coal, as president of the Power-Heafey Coal Company. His company also engaged in the manufacture of some of the first washing machines. A dedicated family man, Power had many wide interests and was amongst others, a member of the Ancient Order of Hibernians. He married twice, first to Mary Quinlan (d. 1888) and then to Mamie O’Malley (d. 1915 who also predeceased him. He has at least 4 children that I could find. He died at St. Joseph’s Hospital, Omaha, surrounded by his sons and daughters, of heart failure, in 1916. For a wonderful tribute paid to the man, by the Omaha Jacksonian Club, of which he was a prominent member, see this reproduction of the article from the “Omaha Daily Bee” newspaper, from Omaha, Nebraska, January 1916. “T. C. Power and Bro” was a prominent mercantile business started by Thomas Charles Power (left) (1839-1923) and his brother John (1844-1901), who were to become well established traders in Montana and across several southern Canadian provinces. Of Iowa and Pennsylvania Irish Catholic stock, their parents Michael Power and Catherine McLeer arrived in Iowa, via Missouri in the 1830s. Their father Michael, himself an established mercantile man, had came to the United States from Ireland as a young emigrant. In 1867, Tom C. Power, having completed his private schooling in Sinsinawa, Wisconsin, travelled up the Missouri River to Fort Benton, Montana and opened a general mercantile store, in partnership with his brother. During the years of the US Civil War, the Powers were involved in trade along the mighty Missouri River, primarily dealing with steamboats. TC Power eventually became president of a steamboat line, at one time owning and operating 9 steamers. The Power brothers gradually established themselves in the trading business and this enterprise was to become very profitable, with thirteen stores being established on the norther US border with Canada and two on the Canadian side. “Power and Brother”, and other notable firms, dominated trade and freighting on the northern plains of the USA by the mid 1870s. Throughout their time in business, the Powers were involved in military and Indian trade (particularly buffalo hides), steam-boating, freight shipping, stage coach lines, mail contracts, cattle ranching, banking, bridge building and town planning. By 1875, their trade with local tribes for buffalo hides reached an incredible 36,000 in number, which they sold to markets in New York, Chicago and other cities. This was a remarkable feat in both accomplishment and value, as a hide was approx USD$2 at the time, translating to roughly US$750,000 or €660,000 nowadays – one hunting season’s gains! When the buffalo herds declined, they continued a profitable trade with miners and stockmen in the area around Fort Benton, Montana. This trade also helped the city of Fort Benton (called the Birthplace of Montana) become an important river trading post, the town, established in 1846, already being one of the oldest settlements in the American West. products, and livestock to Canada. This advertisement, from paper “The Mineral Argus” of Maiden, Montana (1886) and advertising their store in Lewistown, Montana, gives and interesting look at their stock, their large area of trade and a good insight into the firm. When their establishment was incorporated, Power was president of T.C. Powers & Co. and T.C. Powers Mercantile Company of Fort Benton, Montana. After settling in Helena, Montana in 1876, Power started another firm, T. C. Power and Browhich, a prominent mercantile company which served the northwestern United States and western Canada. He also served as president of the American National Bank of Helena and represented the state in the US senate, serving from January, 1890 to March, 1895.The town of Power, Montana was named in TC Power’s honour. We would urge the reader to invest some time in a more in-depth biography of both remarkable men which can be found in the early 1900s publication “Progressive men of the state of Montana”, now available online.